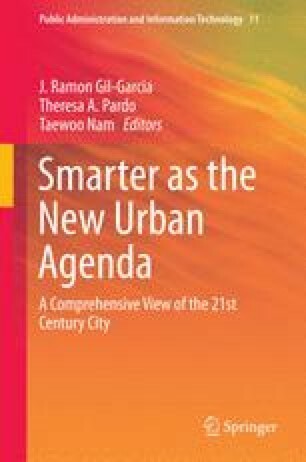 Current smart city frameworks and models are not enough to fulfill the requirements of developing countries in order to face their challenges in applying the smart city concept due to weak integration of social, economic, and political needs, and lack of a holistic and integrated approach to sustainable city development. In addition, most of the developing countries lack the proper means for implementation, proper infrastructures, enough funding, sufficient economic growth, and political stability. Moreover, the challenges that can prevent the success of such a concept are poverty, inequality, cultural barriers, and the continual rise of slums and unplanned immigration from rural areas to cities. This chapter recommends a “strategic implementation framework for smart city” tailored for developing countries such as Egypt. This general framework aims to assist different successive governments in countries such as Egypt to develop and maintain smart city strategies that help sustainable development of the country instead of building separate isolated cities that cannot face different political, economic, social, and environmental challenges. Dirks, S., Keeling, M., & Dencik, J. (2009). How smart is your city? : Helping cities measure progress. (IBM Global Business Services). ftp://public.dhe.ibm.com/common/ssi/ecm/en/gbe03248usen/GBE03248USEN.PDF. Accessed 1 Jan 2014. Dirks, S., Gurdgiev, C., & Keeling, M. (2010). Smarter cities for smarter growth: How cities can optimize their systems for the talent-based economy. IBM Global Business Services. ftp://public.dhe.ibm.com/common/ssi/ecm/en/gbe03348usen/GBE03348USEN.PDF. Falconer, G., & Mitchell, S. (2012). Smart city framework a systematic process for enabling smart + connected communities. Cisco Internet Business Solutions Group (IBSG). https://www.cisco.com/web/about/ac79/.../Smart-City-Framework.pdf. Accessed 1 Jan 2014. Natural Resources Defense Council. (2014, October 11). Sustainable Communities. Natural Resources Defense Council. http://www.nrdc.org/sustainable-communities/. Accessed 1 Sept 2014. State Information Services. (2014). State information services Tourism importance. State information services. http://www.sis.gov.eg/En/Templates/Articles/tmpArticles.aspx?ArtID=67693. Accessed 6 March 2014. Toppeta, D. (2010). The smart city vision: How innovation and ICT can build smart, “Livable”, sustainable cities. (The Innovation Knowledge). http://www.thinkinnovation.org/file/research/23/en/Toppeta_Report_005_2010.pdf. Accessed 1 March 2014. UNdata. (2012). UNdata | country profile | Egypt. http://data.un.org/CountryProfile.aspx?crName=EGYPT. Accessed 8 Jan 2014. United Nations Population Fund. (2009). UNFPA Annual Report 2008. United Nations Population Fund. http://www.unfpa.org/publications/unfpa-annual-report-2008. Accessed 1 Oct 2014. United Nations. (2012). World population prospects: The 2012 revision. http://esa.un.org/wpp/unpp/panel_indicators.htm. Accessed 1 Dec 2013.